But make no mistake—the pinnacle of learning for the man behind Stratford-based Pinnacle Quality Homes is always a day away. Meinen has continually gleaned knowledge from his mentors and the competition in climbing the ladder to one of his region’s most successful home builders—an ascension that started early. Although his parents moved to B.C. when John was 16, Meinen had his own house framing company by the time he was 18. Four years later, in 1982, he returned to Ontario to reconnect with—and marry—childhood friend Arlene Koskamp, who grew up on her family farm just three kilometres away from John and his 10 siblings. “Arlene is extremely supportive of John’s endeavours and very thorough. 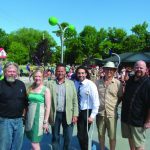 Together they make a pretty dynamic team,” says Stratford-based builder Larry Otten, proprietor of Larry Otten Contracting. 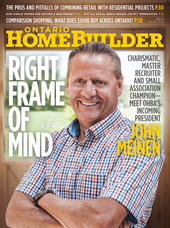 Otten, whose parents also emigrated from Holland, has spent virtually his entire his life growing up in the company of Meinen, and knows that his friend’s legendary charisma will serve him well at the helm of the Ontario Home Builders Association. One of those issues facing OHBA is the imposing shortage of skilled trades. “I try to convince our youth that a college or university degree is not necessarily the be-all and end-all,” Meinen says. “In Southwestern Ontario, 75-80% of our economic activity is still groomed by small business and entrepreneurship. And there’s still a lot of room left to grow. We’re going to be short 30,000 skilled trade workers in the next 10 years. That tells me we’re not doing our job as a governing body and industry to entice skilled trades. But we also have a problem with setting a ratio of three journeyman to get an apprentice. The small mom-and-pop operations don’t have three journeyman; some don’t have any. So I think there are a lot of barriers when it comes to young people in this industry, and that has to change. “You want to redo your bathroom? Your plumber can’t nail in a 16-inch block to hold up a pipe; you have to hire a carpenter. And the average licensed carpenter in Southwestern Ontario is 61 years old,” Meinen continues. “You know what making carpentry compulsory on a jobsite will do? Kill the industry! The good news is that Meinen is no shrinking violet. “He enjoys the spotlight,” Otten concedes, “and he knows how to work the crowd. When John’s in the room, everyone’s knows it. He’s gonna make his way around and touch everyone in a way that leaves an impression on them, whether it’s with politicians or building ongoing or new relationships with the locals. Nobody feels like they’re being passed by or being taken for granted. We’re midway into lunch at Crabby Joe’s, and if Meinen’s typical frenetic pace seems to have a little rocket fuel added to it, he can be forgiven. 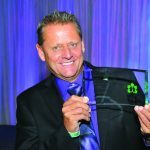 He is fresh from the SABA Awards of Distinction the previous evening, where Pinnacle Homes’ haul included five crowns, capped by Arlene’s Al McLean Memorial Award for the greatest contribution to the association, an honour John shared with her in 2011. “This morning, all my awards went on social media, and different associations are already retweeting,” smiles Meinen, whose Facebook, Instagram and two Twitter accounts are testament to his appreciation of modern communication channels. He was, in fact, likely the first person in the Stratford region to own a cell phone. That would explain the turbocharged 2015 GMC Denali diesel heavy duty pickup sitting in the restaurant parking lot—“The thing flies,” he says—as well the decked-out gunmetal-grey, seven-speed, 2014 C7 Stingray Corvette in the driveway at home. “Zero to 100 kph in 3.7 seconds,” Meinen observes. “I do pretty good under pressure,” says Meinen, who will have Tribute Communities Executive VP of Acquisitions & Land Development Neil Rodgers backing him up in the vice-presidential role for the coming year. Meinen’s eyes light up whenever the topic turns to communication, and his own door is always open for industry associates. A regular speaker at regional association functions, his advice is routinely sought out by fellow members. “He may not have a university degree, but when John speaks, everybody is attentive,” says Arlene. “And they all get the message.